At the same time that federal park officials are flying wolves to Isle Royale National Park in a last-ditch effort to revive the iconic predator's population on the island, scientists are embarking on an ambitious project to study the park's burgeoning population of moose — the wolves' primary prey. Last month, researchers from the University of Minnesota, Michigan Technological University, the Grand Portage Band of Lake Superior Chippewa and the National Park Service captured 20 female moose and fitted them with GPS collars, so they can track where they forage on the island, and ultimately, how they die. The scientists hope to learn more about the impacts of the wolf population's revival on the Lake Superior island's ecosystem. The Park Service is in the midst of a plan to bring up to 30 wolves to the island in the next three to five years. The research will also compare the health of the moose population on Isle Royale, which has ballooned in recent years as the wolf population has shrunk, against the moose population on the nearby Grand Portage reservation, which, while stabilizing in recent years, has declined sharply over the past decade. "By being able to compare these two populations, it will enable us to do better management for the moose population in Grand Portage and will benefit moose in all of northeast Minnesota," said Seth Moore, director of biology and environment for the Grand Portage Band of Lake Superior Chippewa. Even though Isle Royale and Grand Portage are only about 25 miles apart on the lake, the moose populations in the two locations face remarkably different circumstances. Isle Royale's simple predator-prey system, consisting solely of moose and wolves, makes for an ideal ecosystem to compare with the mainland population of moose in Grand Portage, which involves a much more complex system of multiple predators and multiple preys, including wolves and bear, and moose and deer. For the past decade, the Grand Portage Band, with help from the University of Minnesota, has worked to determine what exactly is killing the reservation's moose population, among the tribe's most important subsistence foods. Researchers have placed GPS collars on about 150 moose on the reservation over that time frame — the same technology being used now on Isle Royale moose. The collars send out a mortality signal when a moose dies, enabling researchers to quickly respond to learn what precisely killed the moose. The work on Grand Portage has mirrored a similar project conducted by the state of Minnesota, which is trying to find the root causes behind the moose's sharp decline in northeast Minnesota. 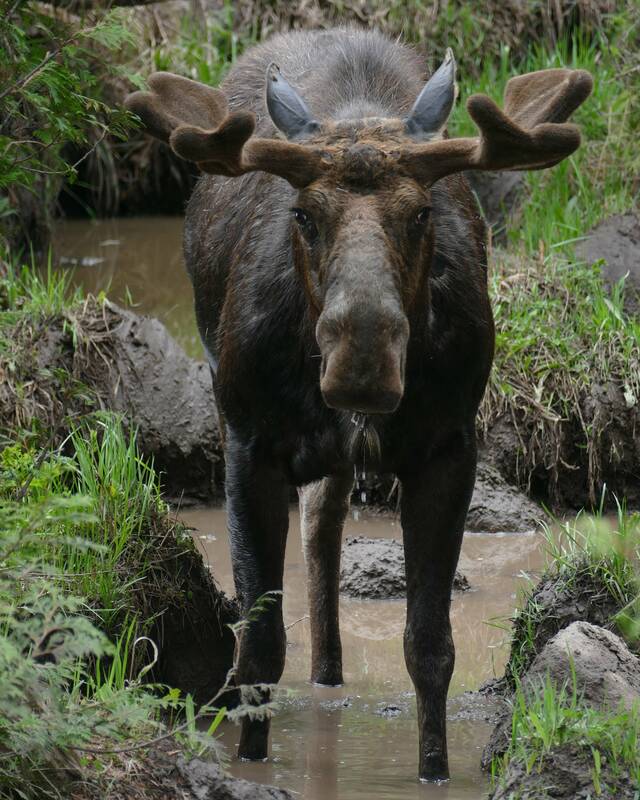 The moose population statewide has plummeted from a peak of nearly 9,000 in 2006 to around 4,000 animals today, where it's stabilized over the past several years. The results of both projects show that predation from wolves, along with a parasite called brainworm, have taken the largest toll on adult moose. On the Grand Portage reservation, about 40 percent of adult moose have succumbed to infections from brainworm, Moore said, a parasite that's transmitted from deer to moose, but which doesn't harm deer. Deer are also linked to wolf predation on moose, Moore said, because large deer populations also cause large wolf populations. And wolves don't just eat adult moose. They also prey on newborn moose in early spring. "Moose calves are one of the easiest things on the landscape to prey upon in the month of May," he said. High loads of winter ticks that have proliferated because of warmer winters, along with a loss of habitat, have also played a role in the decline of moose on the mainland. But teasing out all those different factors is really challenging, said University of Minnesota veterinary medicine professor Tiffany Wolf, who's worked with Moore to collar moose on Grand Portage for the past decade and is also partnering on the new Isle Royale project. "Which one of those is really a key and what we can do about that is hard to know by just looking at one population," Wolf said. "So, this opportunity to compare these two neighboring populations is a really unique opportunity." 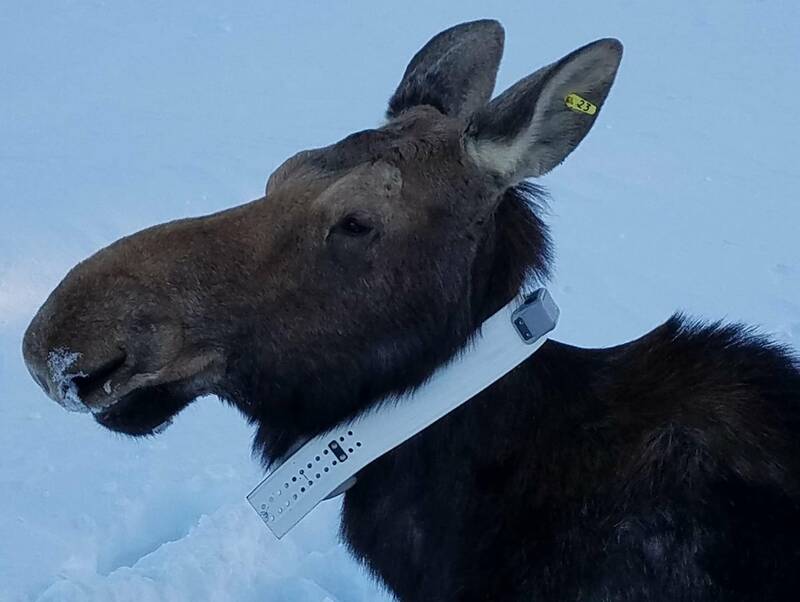 Wolf and Moore, along with scientists from Michigan Tech and the National Park Service, outfit 20 female moose with GPS collars over the course of a week. All the moose survived the capture and collaring, and were able to walk away in under two minutes. After nearly a decade of doing similar work on the Grand Portage reservation, Moore said he noticed immediately that moose on Isle Royale had much higher numbers of winter ticks than the moose he encountered on the mainland. "Are these high tick loads in Isle Royale a result of just a much higher density of moose on the landscape, and is this a factor that's affected by the fact that there hasn't been as much [wolf] predation on Isle Royale?" he said of the kinds of research questions they'll pursue. Scientists also plan to study differences in the health of island and mainland moose populations; how predator dynamics influence moose populations; the role of climate on moose and ecosystem health; and how forest management influences moose. The National Park Service began to reintroduce wolves to Isle Royale last fall, after the wolf population on the island had dwindled to two, which allowed the island's resident moose population to explode to about 1,500 animals. The first pair of wolves released on Isle Royale last September were from the Grand Portage reservation. This year, officials from Canada and the United States are relocating additional wolves from a different Lake Superior island. They plan to bring 20 to 30 wolves to Isle Royale over the next three to five years. At the same time, researchers hope to continue to place GPS collars on additional moose over the next several years to continue researching the complex dance between predator and prey.